What’s your favorite spot for a good cup of coffee, heart-filled discussions and lame political talks? Whatever cafe you suggest today cannot replace the most loved coffee house chain of India, i.e. Indian Coffee House. Informally abbreviated as ICH is the one and only oldest coffee house chain of India which is serving premium coffee and traditional finger-licking food with a friendly ambiance in almost every part of the country. Stepping into such a legendary coffee house itself mesmerizes you with the pleasant scent of hot-serving dishes and takes you on a trip to the flavors of British India. Indian Coffee house secures a special space in the hearts of millions of Indians for generations now. I.C.H. is popularly known for its free-falling ambiance and affordable beverages and quick meal but more importantly, this coffee house has an engaging environment but if you want your space will remain uninterrupted for as long as you want. As long as you have your ideas and thoughts flowing, you can enjoy your own company without even placing an order for the table. Such an Iconic Coffee house comes with an interesting history and fascinating stories about it, are you ready to learn more about the best and oldest coffee house chain of India? Stay along! The original Indian Coffee house chain was started in 1936 by the Coffee Cess Committee (Coffee Board) during the British rule. Later in mid 50s the board decided to shut several coffee houses across the country which led to a rising issue of unemployment for those who devoted a major part of their lives to coffee house. This issue was heard and understood by great communist leader A.K.G (Ayillyath Kuttiari Gopalan Nambair) and then he took a decision to create a society collecting employees and organised societies all over India in various state. The committee is known as “India Coffee Board Worker’s Co-Operative Society. The first society was formed in Bangalore on August 1957 and following that the first new generation Indian Coffee House opened in Delhi on 27th December 1957. 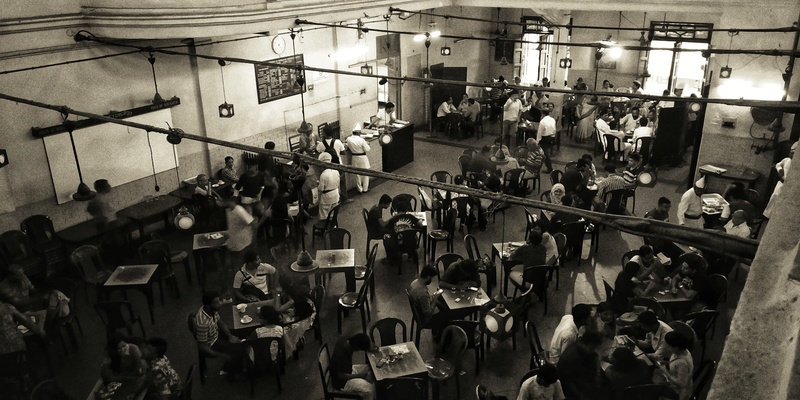 And since then Indian Coffee House has made its strong presence with almost 400 coffee houses. Till date the management of all the branches is entirely managed and decided by Indian Coffee Worker’s Co-operative Society Ltd from different parts of India. ICH unlike other coffee house chain is not owned by a private name and the society is governed by an eleven member managing committee elected from the employees. Though, Kerala stands with maximum number of coffee houses i.e., over 51 outlets, ICH has successfully established its special corner in almost every city of India. The wide-ranged but reasonable menu is one of the Unique-standing points of this chain. Starting with hot coffee at Rs. 15, this menu includes a palate of food items and beverages. What’s your mood? Up for some snacks or a well-served Thali would be good? Whatever it is ICH has got it all. The specialty still lies with south Indian dishes and filter coffee (Off the records- cold coffee isn’t suggested!). And if you are a big fan of non-veg, the menu has a list for you too, just keep on turning! The services provided are quite appreciable as the food served is not only hot and delicious but also hygienic and healthy. Your food reaches your table within 15 minutes of order, and mostly in a lesser time. The employees are very humble and polite which adds shinning stars to this cafe. In Indore city, the biggest outlet of Indian Coffee House is at DAVV campus and other than that people residing near several areas like, Jail Road, M.G. Road, Bhavarkua e.t.c can always enjoy a hot cup of coffee at ICH easily. As much as ICH reminds of British era to the youngsters, it is an old treasure book for the older generations. ICH leaves everyone astonished because of its one in a self working process. ICH regulates on the traditional norms and does not clone to the others in decor, menu and pricing. ICH stays immune to all the marketing stunts and trending shows and maybe that’s why it’s in a bit of drowning condition in this competitive world. So next time, while choosing to visit for a hangout place or let’s-get-creative seat, do consider the retro themed traditional cafe once!